Why Buy Security Doors From Guida? Our experienced sales consultants will help you design the perfect door for your home by recommending styles and options that will secure and beautify your entryway. Our security storm doors are recognized within the industry as having leading security features that will keep your home safe. We take extra measures to ensure your family will be safe by using only the best quality materials and parts available. Our custom steel security storm doors are proudly made in the USA. There is no compromise in quality of workmanship to ensure that you receive a product you can count on that will last for many years to come! Deadbolt has full 1” throw with protective steel lock guard on door frame. Available in Polished Brass, Antique Brass and Satin Chrome. Hidden vault pins behind top and bottom hinges provide additional security. Adjustable bottom expander with integrated dual fin sweep. We use only the finest furniture grade steel to make our doors. Heavy gauge all welded door frame construction with lifetime warranty. Outperforms standard ornamental door liquid paint in weathering, ability and resistance to fading, cracking, chipping and corrosion. Available in many designer colors! Three 7” forged steel hinges with non-removable screws. Adjustable door closing speed. Chain with shock absorber prevents damage from strong wind. With integrated steel dust box. Factory mounted for additional strength and security. Optional mailslot or magazine slot for added convenience and mail protection. Optional upgrade to a designer lever on the mortise lock. Heavy Duty designer lever lock for full view style doors. 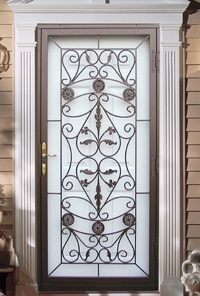 Our 700 Series doors reflect the timeless beauty of hand-made solid wrought iron construction. Our 600 Series doors offer the latest technological advances in metal fabrication. Each door style is computer designed and precision laser cut out of solid steel plate. Our 500 Series is the original design in security doors. With many styles to choose from, you'll be sure to find one to meet your needs.